Parkview adds a sophisticated, upscale look to any décor. 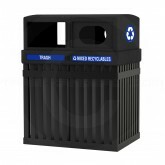 This environmental friendly unit is perfect for any outdoor application and supports your facilities green initiatives. 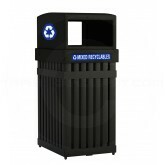 Waste container base is constructed of heavy-gauge, fire safe vertical steel rails; unit offers extreme durability. Weatherproof, powder-coated finish provides long service years. ¾” feet add stability and help prevent unit from being damaged by the weather elements.